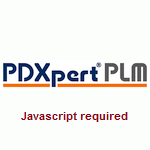 The PDXpert PLM repository for electronic data is "file format neutral". It can manage any Windows file up to 2 GiB in size, including CAD files, computer source and binary code, PDFs, text specifications, presentations, budget spreadsheets, and graphic images. Files may be checked out for modification, copied as the basis for a new design, or simply viewed with the creating application or downloadable third-party viewers. Each file can be assigned to an item master, or a specific revision of an item. Item master files can be managed within the library or may be located in an outside location (such as supplier or customer website). Revision-level files can't be modified or deleted from the revision record after it's been formally released. Any number of electronic file attachments may be associated with any item (document, part, change). 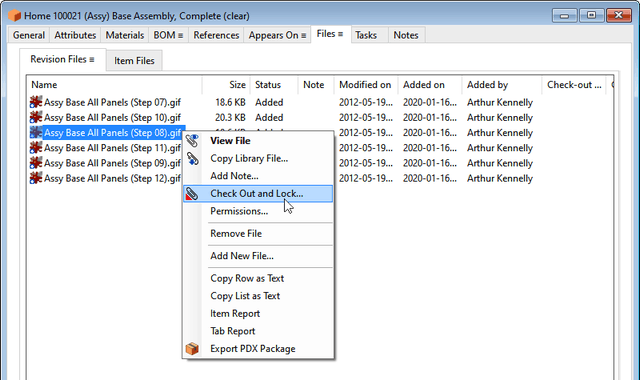 For example, it's common to attach the original CAD file to a specific revision record, as well as a PDF for system users who do not have access to the original CAD tool. Library files are maintained separately from the database tables, which increases performance while significantly reducing the risk of file loss due to operating system, hardware, or database errors. Files are assigned unique aliases on check-in, eliminating naming conflicts. Users view a copy of the checked-in file, while the original file remains securely in the library.